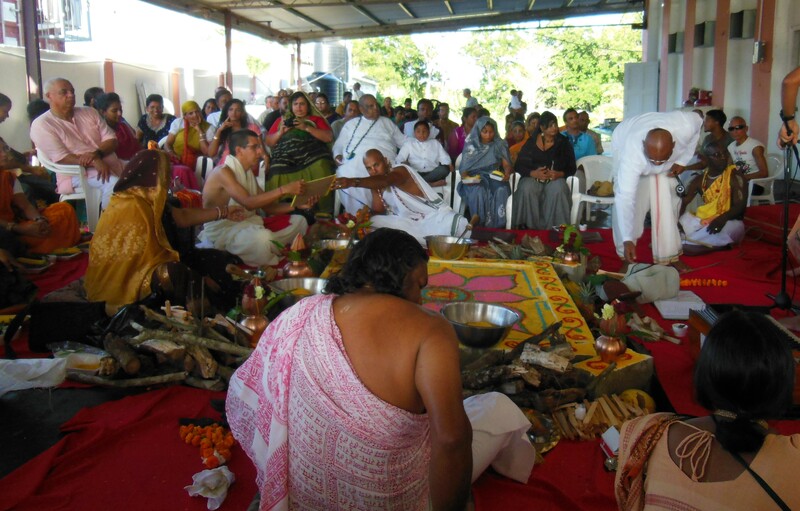 Sri Sri Radha Gopinatha Mandir celebrated their 10th annual Nrsimhadev Caturdasi Yagya on Tuesday 13th May, 2014. The program started approximately 3:15 p.m. after many preparations were done by the resident devotees. 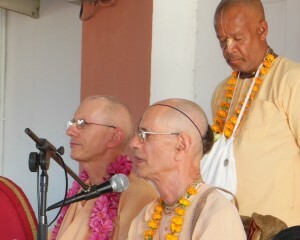 Kirtan was performed by Bhakta Avinath at the commencement of the program. Shanta Vigraha Das then began the Yagya by carrying out the purificatory rights, followed by the recitation of the Sankalp. The discourse was then given by both the temple’s resident sannyasi, His Holiness Bhakti Prabhupada Vrata Damodara Swami along with the GBC of Trinidad, His Holiness Guru Prasad Swami. They reassured the assembled devotees that Nrsimhadeva is the protector of the devotees and that we should take shelter of the Lord just as in the case of Prahlada Maharaj. They also made mention of incidents in the ISKCON Mayapur Yatra where Lord Nrsimhadev protected his devotees in a very personal way. The discourse was followed by the large fire sacrifice where over 100 devotees proceeded to offer grains into the fire, accompanied by ghee offerings made by the four assisting priests that were present. After the final offering of the banana, everyone was asked to circumambulate the fire while kirtan was being led by His Grace Agni Dev Prabhu. At 6:15 p.m. all the devotees and guests gathered in the temple hall to witness the maha aratik ceremony of Their Lordships Sri Sri Radha Gopinatha and Gaura Nitai. The fiery kirtan was again led by His Grace Agni Dev Prabhu and the devotees chanted and danced in ecstasy. A sumptuous feast was then served to everyone at the culmination of the event. The program was also streamed live on mayapur.tv by Dattavara Das and a video of the festivities was also uploaded on YouTube can be viewed at the following link: Nrsimhadeva Yajna. 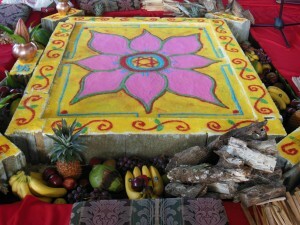 You can also view some photos from the Yajna at the following link: Nrsimhadeva Photos. Today we celebrate the auspicious appearance of Lord Nrsimhadeva, who appeared to give protection to His unalloyed devotee Prahlada. On this occasion we present here an excerpt from a lecture by Srila Prabhupada in February 1970 where he gives a purport to the Jayadeva Goswmai song, Das-avatara Stotra. We have extracted the segment that deals specifically with Lord Nrsimhadeva. 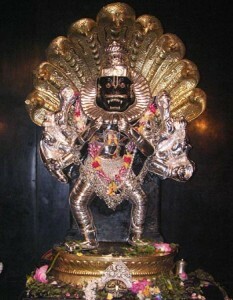 Srila Prabhupada: “The fourth incarnation is Nrisimhadeva. Nrisimhadeva appeared to save Prahlada Maharaja, who was five-years-old boy and he was being tortured by his atheistic father. So He appeared from the pillar of the palace as a half-man, half-lion. Because this Hiranyakasipu took benediction from Brahma that he’ll not be killed by any man or any animal. In this way he utilized his intelligence in so many ways just to come to the conclusion of being immortal. But the Lord is so cunning that He kept intact all the benediction given by Brahma, still he was killed. He said that “I’ll not be killed either during daytime or night.” Brahma said “Yes.” So he was killed just in the evening, just in the junction of day and night. You cannot say it is day or night. He took the benediction that “I shall not be killed in the sky, on the water, on the land.” So he was killed on His lap. He took the benediction that “I shall not be killed by any man-made or any God-made weapons.” That was given, “All right.” So he was killed by the nails. In this way, all the benedictions were kept intact, still he was killed. Similarly, we may make plan, we may make very advancement in scientific knowledge, but the killing process of nature will be there. Nobody can escape. By our intelligence we cannot escape. The four principles of material existence means birth, death, old age and disease. We can manufacture many medicines, many weapons, many means, many methods, but you cannot escape these four principles of material existence, however great you may be. That was proved by Hiranyakasipu. On behalf of Sri Sri Radha Gopinatha, Sri Sri Gaura Nitai, Sri Sri Jagannatha-Baladeva-Subhadra and Srila Prabhupada, with great pleasure, we welcome you to your window into your local Hare Krishna Movement. 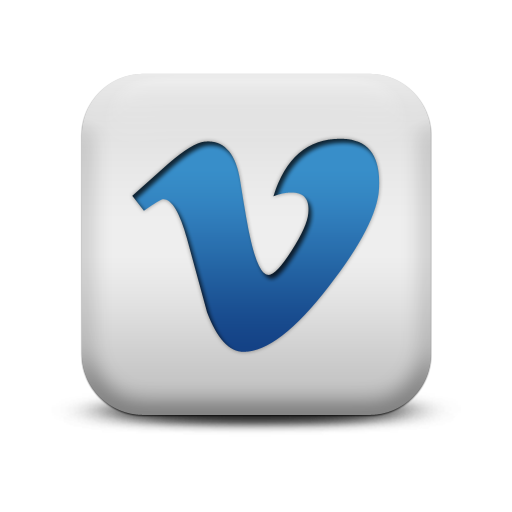 This website has been a long time coming and is born of a genuine desire to improve the quality of our service to you. From our humble beginnings during the 1970’s ISKCON Trinidad and Tobago has grown considerably and is continuing to grow and as such there was a greater need for our organisation to raise the bar of our service to our devotees, congregation members and the wider public. The casual visitor will find some introductory information on the ISKCON movement, our philosophy and practices as well as a very efficient means of contacting us. A more serious spiritual seeker will find articles and videos dealing with different aspects of spiritual practice and guidance on how they can practically inculcate these measures into their own lives. Our regular devotees will find dates of all our upcoming events, including ekadasi days as well as the time to break the fast, schedules of all visiting guests and timely posting of all relevant ISKCON News. The site is also being populated by our online Flikr Albums, Sound-cloud audio service, Vimeo and YouTube video feeds and a direct feed from our Official facebook page Iskcon Trinidad and Tobago. It also has a direct link to our live broadcast on Mayapur.tv. Through the use of specially designed Contact Forms visitors can contact us directly to make general inquiries, sign up as a volunteer or even request a satsang or program. Additionally the website will allow us to connect with our congregation and devotees. Visitors will be be given to option to enter their email addresses so they can be placed on our mailing list and receive our local e-Newsletter which we will be launching on the day of Apara-Ekadasi (May 24th 2014). This newsletter will be mailed out each ekadasi to all subscribers. This feature will be launching this Wednesday 14th of May 2014. There is much more than can be said but we prefer to allow you use the site, and hope you will do so regularly. It is our sincere desire that this project acts as a means for bringing all of our temples closer together and to bring our organisation closer to the citizens of Trinidad and Tobago. We sincerely pray for your blessings that we may be able to continue this service, primarily for the purification of our own hearts and also for the pleasure of the Vaisnavas. Respectfully, Your Web-Servants, ISKCON National Board.